Here it is!! Alloy &Torque: Trainwrecked!! From the creative mind of former Adrenaline/Warner Music artist Lonnie “Lo” Plater comes a new venture in an entirely new direction. 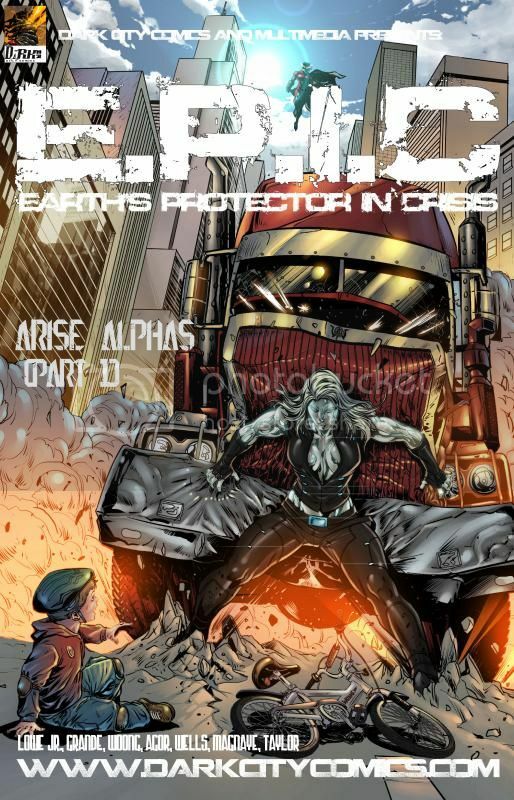 His first offering as comic book author called E.P.I.C: Earths Protector in Crisis, a brand new comic series from his Indy comic book company Dark City Comics. 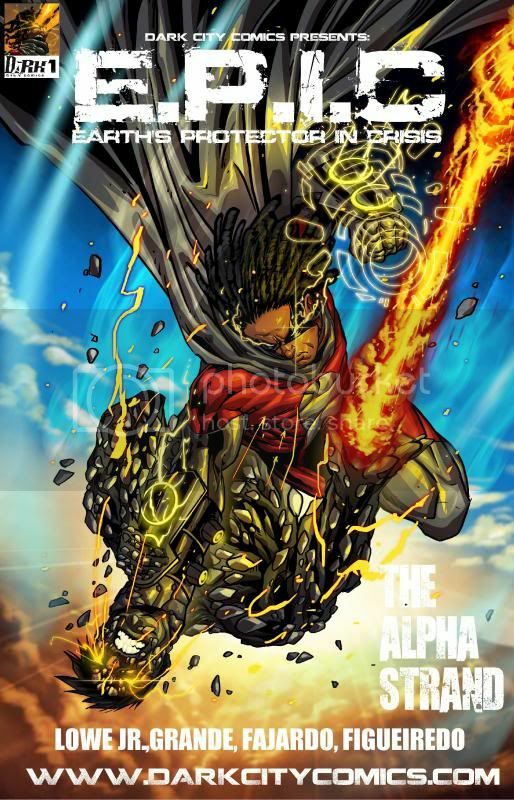 The story centers around college sophomore Christopher “Chris” Tayborne”, a young and talented archeology major, that through a series of sudden twists and turns lands his hands on one of the most powerful weapons in the known Galaxy The Alpha Bands. In the same breath he also unleashes a power back into the world that it hasn’t seen for thousands of years and has long since forgotten. Once these powers are release the planet goes from ordinary to extraordinary in a matter of minutes changing the scope of the entire globe and almost immediately creating our Alpha human population thus setting the events into place that give life to the Dark City comics Universe. 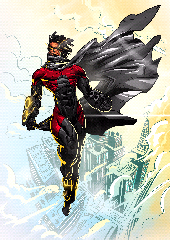 Initially Epic will be pitted against Boris Zane; a former military grade weapons dealer turned philanthropist who through the activation of his alpha strand becomes Lavace, an arch nemesis unlike anything the comic book world has seen before. Hold on for a fast paced series of high action stories about coming of age, sacrifice, perseverance and true heroism. 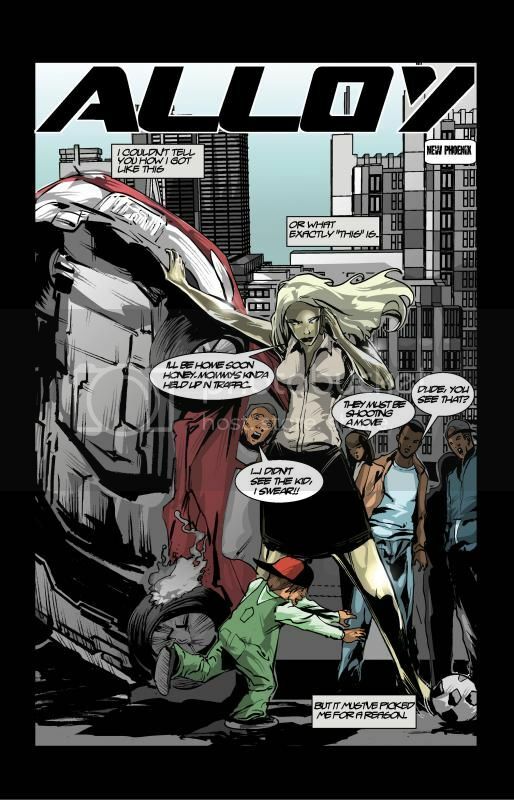 Here at Dark City Comics our mission is simple to transfer the diversity of the real world into our comic book world while telling amazing stories that everyone can enjoy. So get ready for a thrill ride unlike you’ve ever seen before. Set to release digitally this fall and later in print on demand format for the purists. Dark City Comics is an Independent comic book and graphic novel publisher founded in 2009 by a former Adrenaline/Warner music artist Lonnie “Lo” Plater to continue satisfy his creative itch after turning away from the music business. With plans to release comics and graphic novels in ever genre and sub genre his initial offering will be Super Hero Sci-fi action followed by a few surprises sure to shock the Indy comic world. Coupled with amazingly talented artist from various backgrounds the goal is simple, to provide you with amazing stories and fresh takes by some of the finest new writers and artist working in the medium today. First blog entry of many. I'm new to this so bear with me. What up y'all? This is Lonnie "Lo" Plater, lead writer for Dark City Comics. A lot of people may have questions so let me get them out of the way now. Feel free to add more if I missed any. First of all, where can we find you? Make sure to like us and drop a line. Who is Dark City Comics? So how many of you are there? Just to make amazing stories that all people can enjoy. We'd love to venture into animation, I think that Epic would be a damn good story that could transfer over into an animated movie very well. Also a toy line and all types of merchandising. How'd you get into comics? Well it was a lil’ different for me. I grew up in the Ghetto's of Landover Md. My entire comic universe consisted of a small newsstand carousel in the back of the 7-11 near my apartments. For some odd reason the guy would stock the normal Batman, Superman, Spider-man etc.. He also stocked any black superhero anything he could find. When Milestones first launched I was in hood hero heaven. Mr.T also had a series and I loved Shadow Hawk (didn’t even know he was black) I had a small intro to the comic world plus it was inconsistent so whatever story I wasn’t able to get a hold of I would imagine what happened in that book, started writing, started rapping now I'm back to writing. Loving every minute of it. What do you think you're bringing to the comic world? I would like to think we're bringing new light to the Black heroes. Just showing us in a more regular light than how we've been portrayed in the past. Also just different heroes and villains from different ethnicities and all walks of life. Most comic universes are 80% white, 5% alien origin, 5% machine 5% monster/creature 2% animal 3% ethnicity (all inclusive). I think the reason for that is similar to mine, most people draw from their life experiences and surrounding so if the writer's white the bulk of his/her universe will be as well. No biggie. So this is a "Black" Comic Book? No! This is my comic universe based on the environment I grew up in. I didn’t grow up in rural suburbia so my books don’t reflect that lifestyle. I'm from the urban side Landover Md, DC Metro Area (95% black). For those of you who don’t know, that is where Maryland, DC and Virginia meet so you can imagine the types of folks I've come across in my lifetime. Good, bad and a trailer load of ugly. So it’s going to be all "Ghetto"? No. You'll be able to read our books and enjoy them just like you would any other title your currently into. How'd you come up with Epic? I have two previously written books. I wanted to see if I could actually write a series. The story E.P.I.C revolves around this young college sophomore Chris Taborne. Through series of unforeseen events stumbles upon one of the mightiest weapons in the galaxy. He's given powers that he doesn’t understand and can barely control. 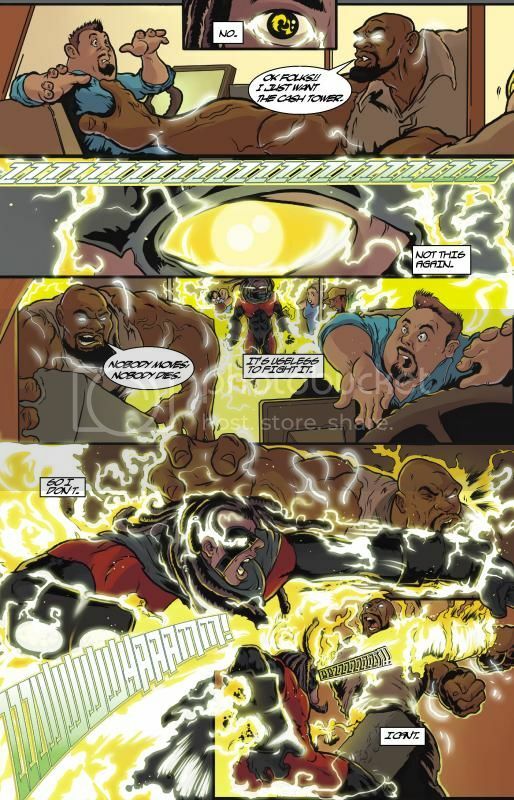 With his new powers he also unleashes new powers into the world and random people are given superhuman abilities. Both good and bad and for some reason or another they are all drawn to the source, him. Now with the aid of an unlikely mentor and an absolutely evil man who will stop at nothing to gain control of his powers. He has a new mission in life, Save the World. He is now Earths Protector In Crisis. Well; if all goes well we'll be creating a new creative team and releasing a couple books a month both hard copy and digitally.